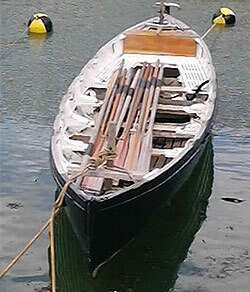 Construction: The hull is of clinker build of Mahogany on Canadian Elm risings and stringers. The photograph Fig. 2.4 shown here is of the most recent acquisition to the trust. 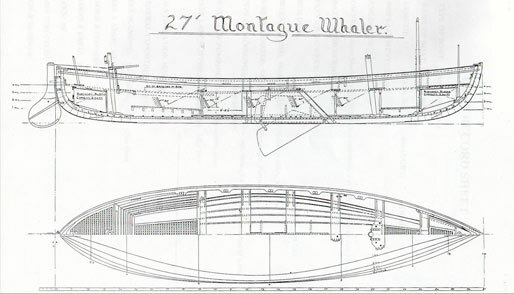 She is a Montague whaler, 27 Feet overall and clinker built using Mahogany planking on Canadian Elm ribs / frames and risers. She was built in 1964 at the Apprentices school at Flathouse jetty at Rudmore in Portsmouth and was one of the last in service with the Royal Navy. This whaler is currently undergoing a small refurbishment programme due for completion in early 2002 at which time she will go back onto the mast pond for display purposes and being in very good condition she will also be available for demonstration use. The smaller photographs shown below, demonstrate some of the early stages of work being carried out, namely replacement of the starboard rubbing strip and a forward section of capping, one thwart and several knees and gratings. The trust also has a second whaler that it has owned for several years. This boat was built by shipwrights in Devonport Dockyard in 1965. She is shown below at an early stage in her program and as can be seen is undergoing some extensive refitting. At present stage, today, she has had about half of the projected work completed. Restoration started in 1997with work suspended for some 18 months, now the planned completion is later in 2002 when she will also be put afloat on the mast pond for display and exhibition use. Both whalers will be fully rigged for sail when completed.